Growing up, camping was big part of my summer. I went to Girl Scout camp and went camping with family and friends in Lake George, and other spots in the Adirondacks. We camped in tents and pop up campers, and sometimes in cabins! I loved sleeping outside, swimming in the lake, hiking, and sitting around the fire telling stories and playing games. I also loved the food!! We made whole meals in foil “packets” cooked over the camp fire, roasted hotdogs on sticks we found on our hikes, and made “Toad in a hole” for breakfast. 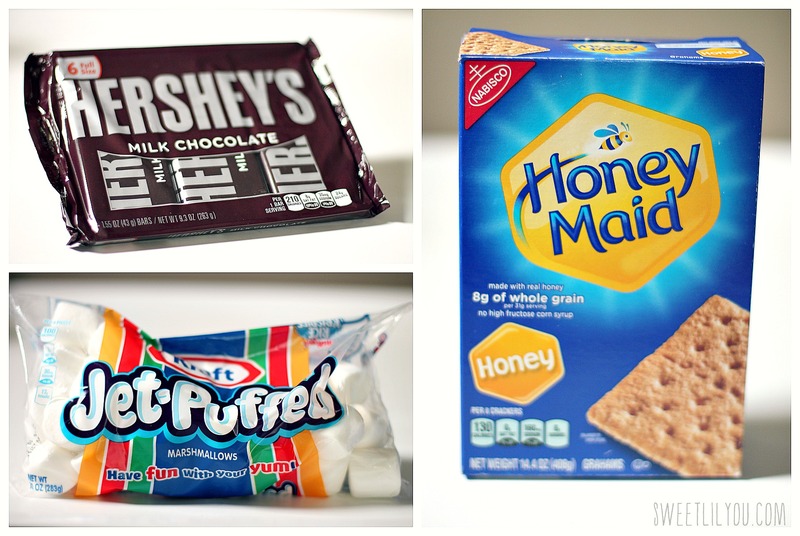 But my favorite camp food has always been s’mores! I had been talking to a friend recently who just took her 3 year old camping for the first time and it got me thinking about how much I want to take Avery camping. Not just for the outdoors experiences (which we all love) but also because camping gives you a chance to unplug. You don’t have a choice if you go to a more remote location without cell service, or electrical supply. I was thinking about how nice it would be to have a few days to just hang out as a family without our phones, computers, and ipads. 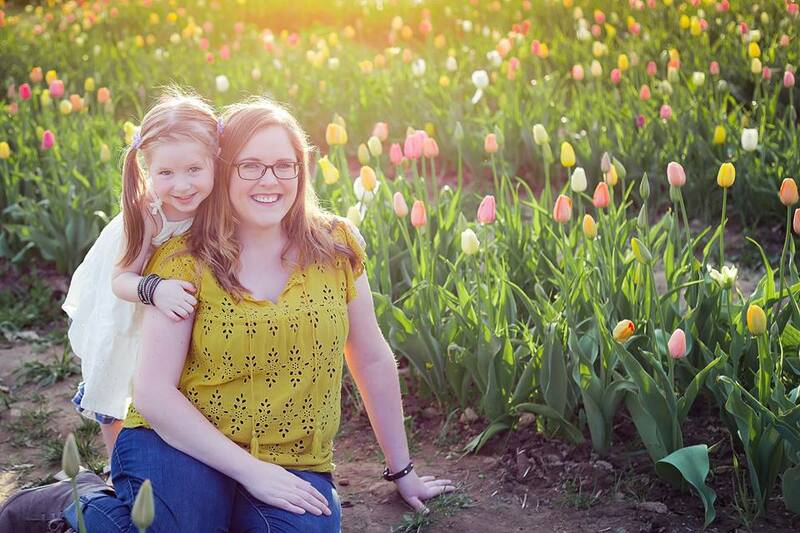 Unfortunately, our weekends are jam packed with conferences for me, work for Dave, and birthday parties for Avery, so we can’t go camping any time soon. However, that doesn’t mean we can’t pretend! I decided to have a Camp “in” right in our living room. We put our phones away, shut down the computers, unplugged the TV, and just had quality time together! Since we were indoors, we couldn’t exactly build a campfire in the middle of the living room. Well, not a real one, anyway! So I quickly cut pieces out of foam core, painted, and assembled out own little faux-fire! It must have been realistic enough (and we must be teaching her well!) because Avery kept telling us that she couldn’t go near the fire, or she would get a burn! I decided to make s’mores bites! 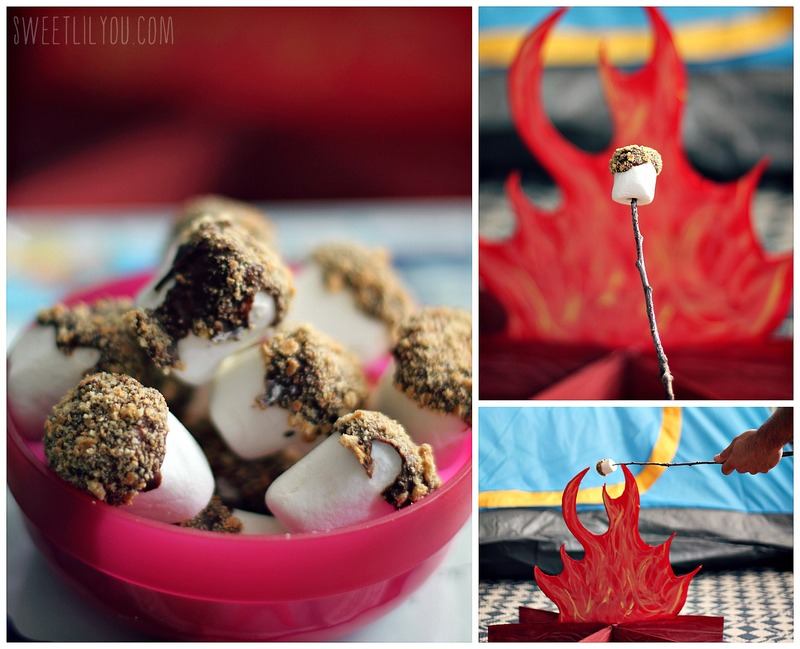 I had made these for Avery’s camping themed birthday party and they were a huge hit! 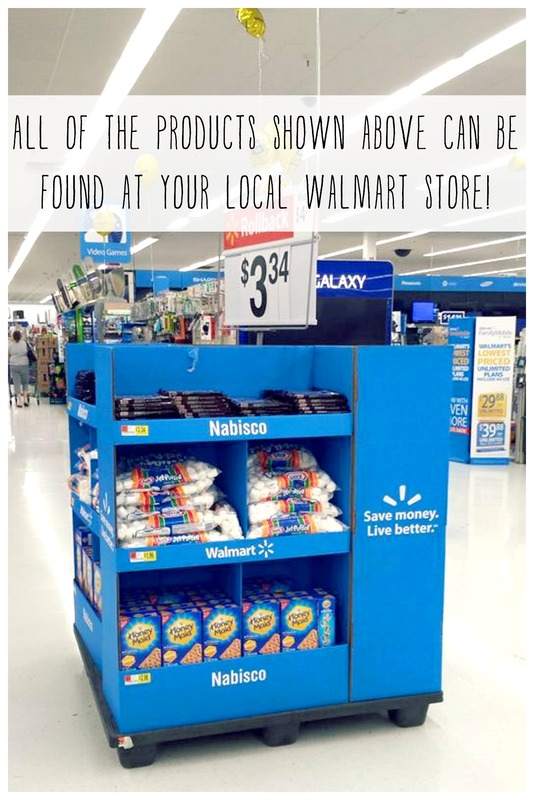 They are so easy to make and take less than 10 minutes! 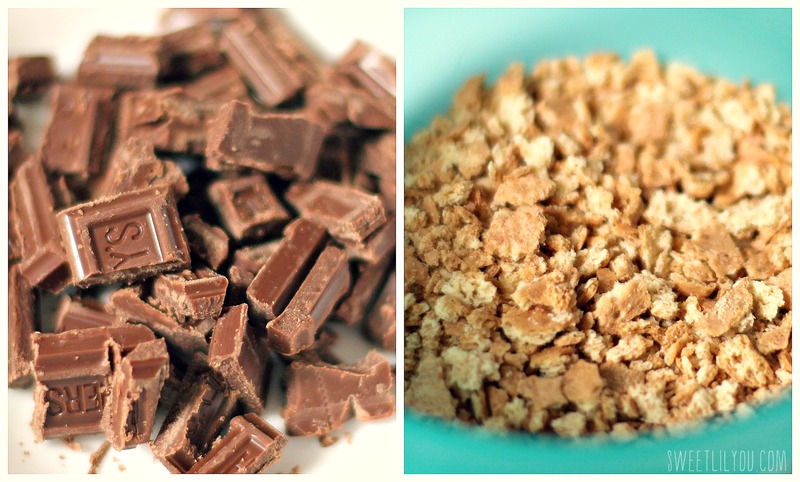 You’ll need to chop up your Hershey’s bars and crush your Graham Crackers. Next, you will melt your chocolate. I put mine in for 30 seconds, then removed it and stirred it up well. I then popped it back in for about 10 seconds, and at that point it was perfectly melted! 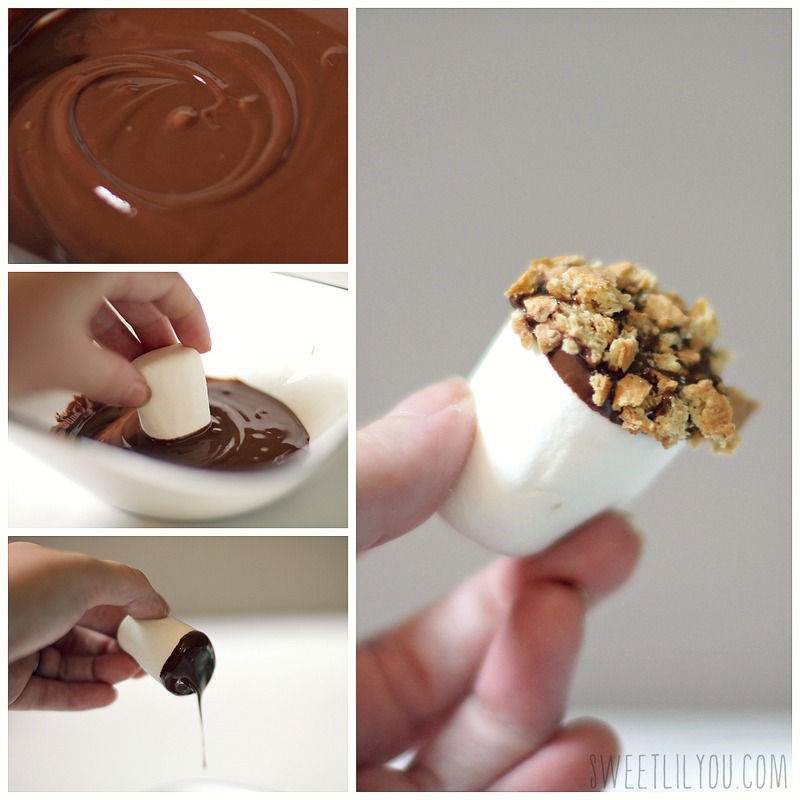 To make your S’mores bites, you just dip the marshmallow into the melted chocolate, and then dip it into the graham cracker crumbs. Place on a plate (if you can keep yourself from just eating it right then and there) and you’re done! These bites are delicious served warm, or chilled if you need to make them ahead of time! 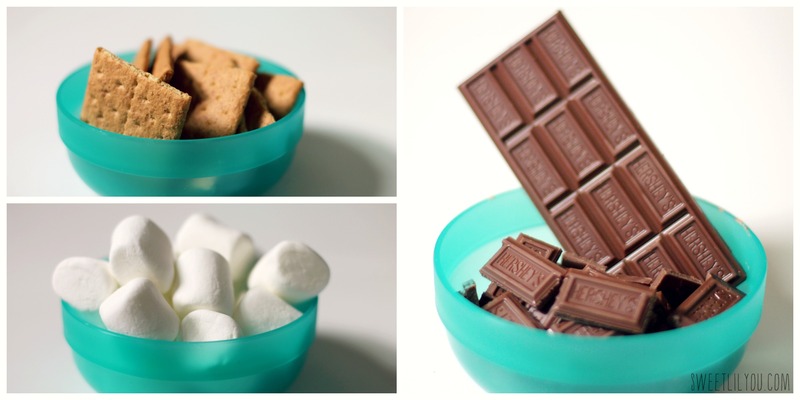 You don’t always need a campfire to make S’mores, you can use the microwave, too! 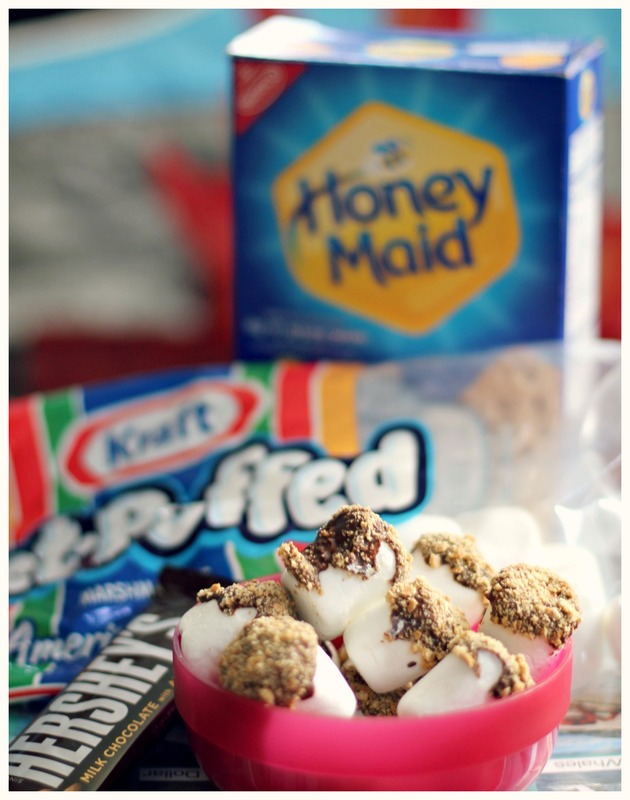 These S’mores Bites were perfect for our family camp in and it was the perfect way for our family to unplug and enjoy our time free of phones, and other devices! 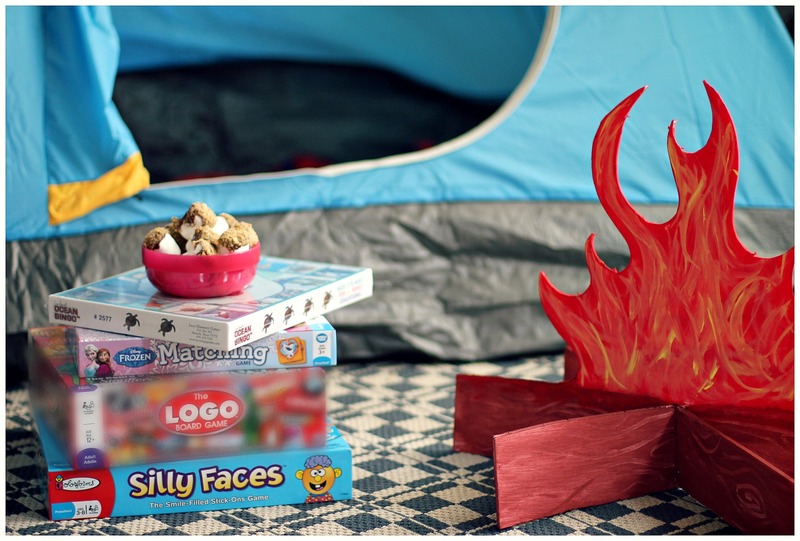 I’ve shared how we create fun, tasty, and memorable experiences with S’mores. 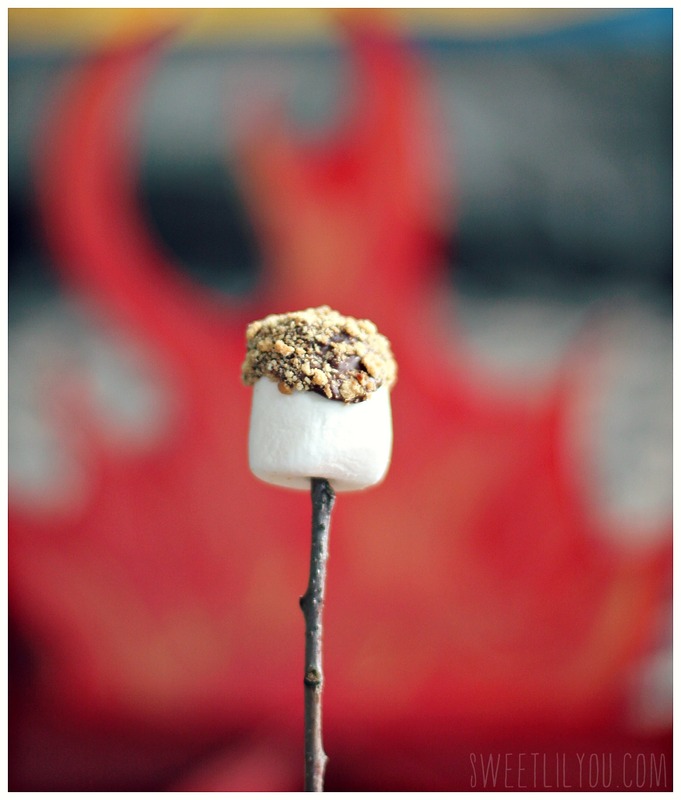 I’d love to hear your favorite way to make and enjoy S’mores! 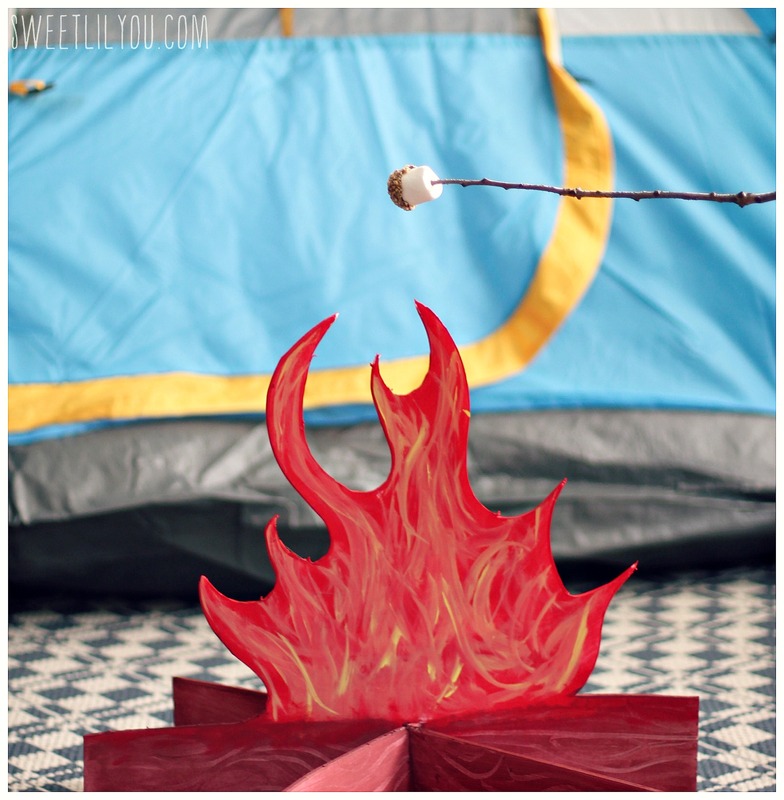 This entry was posted in Family Fun, parties, Recipes, Uncategorized and tagged camping, dessert, family, recipes, s'mores. 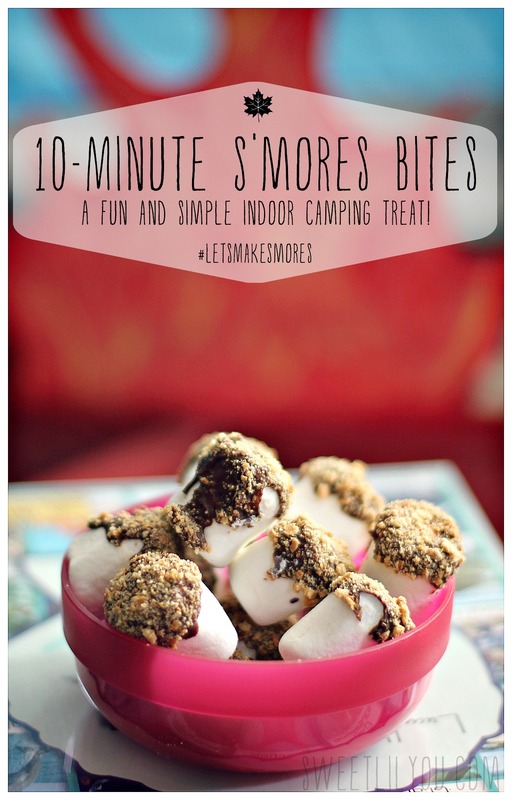 I absolutely LOVE this idea of inside camping and these S’mores bites! I’ll have to make myself up a batch tonight! !